RTE 2FM presenter, Rick O’Shea and Ronan Rogers, Director of Research & Development, Medtronic Parkmore launch space rockets with 2nd class students from Scoil Chaitriona, Renmore, Galway at Medtronic Parkmore Customer Innovation Centre. The Students were Maya Badreddine , Patryk Swierad and Fionn Casey from Scoil Caitriona Renmore Galway . Photo: Andrew Downes, xposure. RTÉ 2FM presenter Rick O’Shea officially launched the 19th Galway Science & Technology Festival, part of National Science Week, hosted by the main sponsor Medtronic Parkmore in their Customer Innovation Centre on Tuesday. 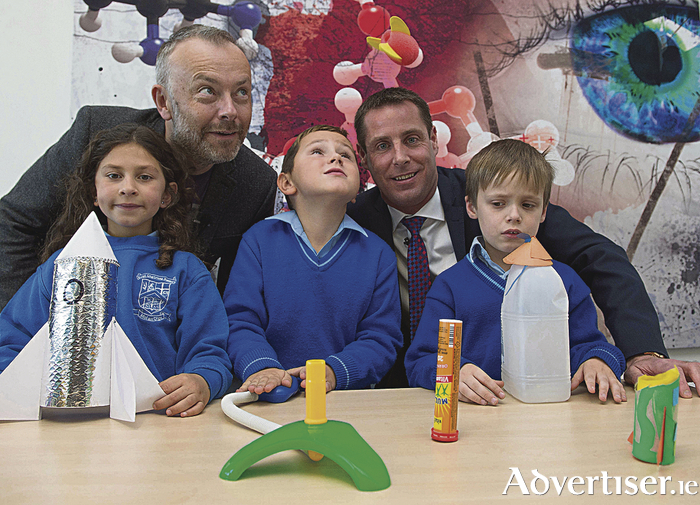 National Science Week will run from the 13-20 November with eight counties throughout Ireland hosting Festivals. Galway is the largest and only two-week Festival in the country and a recent Science Foundation Ireland (SFI ) report highlighted that while five per cent of the Irish population live in Galway City and County, an astounding 24 per cent of activities during National Science Week take place in Galway. Positive statistics for Galway, which is fast becoming and continues to grow as a major player in the global technology and medtech sectors.The 2016 Festival will host 180 free events and 35,000 primary and secondary school students will take part in shows and workshops from the 14-27 November. This year’s Festival will explore and celebrate the theme Science Rising in this the International Year of Global Understanding, exploring how the local affects the global. Events will take place during the two weeks in schools, colleges, research institutes, companies and community centres across Galway City and County. Speaking at the launch, Ronan Rogers, Research & Development Director, Medtronic Parkmore said: “This is Medtronic’s 15th year as the Festival’s main sponsor and we are delighted to be hosting the launch at our Customer Innovation Centre. Science and Technology is all around us, and these disciplines underpin our daily lives. By partnering with the Festival we are able to engage with young people and encourage the pursuit of careers in science, technology, engineering and maths. Medtronic is a global leader in medical technology, services and solutions, and through innovation and collaboration Medtronic improves the lives and health of millions of people each year. At the launch, second class students from Scoil Chaitríona Junior, Renmore launched a space rocket that they recently created for Space Week, while Transition Year students from Coláiste Bhaile Chláir, Claregalway spoke about their enthusiasm for STEM research and enjoyed a tour of Medtronic’s Customer Innovation Centre. A county Galway launch followed at Garbally College, Ballinasloe with students from Ardscoil Mhuire, Creagh National School and Clontuskert National School attending. With Galway fast becoming a hub for the Gaming Industry, Brenda Romero of Romero Games will give a talk to Transition Year students in NUI Galway, James Soper will bring his new show Juiced: The Million Volt Electricity, and Dr Ken returns with numbers, patterns, shapes and mathematical trickery. Primary school students can look forward to a new STEM workshop Nature’s Power Energy in Action at Brigit’s Garden investigating solar, hydro, wind and biomass technologies. Also new this year is Connemara based Maths Academy’s fun and creative Sound, Music & Maths workshop, and Learn It’s Lego Education Workshop will introduce robotics to young children. NUI Galway’s scientists and engineers are providing an array of workshops, lab demonstrations and events both in schools and on-campus. School visits include the new Festival show Build a Burglar Alarm teaching the principles of electronics and programming. Join members of the University Surgical Society to Try your Skills as a Surgeon, or learn about the functioning of the human heart and the role of biomedical engineering in CURÁM’s How to Mend a Broken Heart. GMIT will open their doors to secondary school students for a fantastic STEM Day event on Thursday 17 November, which will feature a workshop The Science behind Sport combining sport and science to explain how the two interact and how science is now central to an athlete’s performance. Other workshops include the Humpback Whales of Cape Verde screening narrated by Liam Ó Maonlaí, The Return of Laser Grid, Bacteria - it’s a bug’s life and the Scientist-in-Residence will bring scientists and engineers to schools and mentor students on STEM based projects. The Marine Institute in Oranmore will once again open their doors and host an Open Day for Transition Year students on Wednesday, 23 November where students will be invited to meet the scientists and see the work of the Marine Institute. Other events include Ireland’s only Outdoor Classroom in Terryland Forest Park on Saturday, 19 November at 12pm. Visitors can enjoy a practical demonstration on ploughing a field and the scientific benefits it brings to families and also learn about local habitats, conservation and biodiversity. Tours to exhibitions and museums include New Art, Old Computers exhibition taking place in Insight Centre’s DERI Café, Dangan, an exhibition of paintings of vintage computers by artist Red Burke from the 23-25 November. Pádraic Pearse, the Murder Machine & Galway Schools 1912-1921 exhibition is a photographic gallery of Galway schools during that period from the BEO digital local heritage archives project. It will be open on Friday, 18 November at 12pm in Galway County Council. Activities taking place at the Insight Centre for Data Analytics include Tech4Moms, a new initiative aimed at 25-plus year old women with little or no knowledge of IT covering social media, computer gaming, security and blogging, and A Hackathon for Girls’ aimed at second level female students to learn how to make thematic websites. Galway UNESCO City of Film with Galway Film Centre, in partnership with CÚRAM Centre for Research in Medical Devices and Science Foundation Ireland has announced the two film commissions for the Science on Screen 2016 project. The two 26-minute movies, featuring CURÁM’s research, will premiere in An Taibhdhearc on Saturday, 19 November. Teachers can book a free school workshop or show by completing the booking form on the website www.galwayscience.ie Booking details for events at NUI Galway and GMIT are also available on the website. The final day Festival Exhibition takes place on Sunday, 27 November from 10am- 6pm. Tickets for shows and workshops will be available for booking on www.galwayscience.eventbrite.com from Saturday, 19 November at 11am. Follow us on Twitter @galwaysciencefe and on www.facebook.com/galwayscience and use the hashtag #scienceweek and #GalwayScience to join the conversation.